Sooji halwa is one of the most common and popular traditional Indian desserts. Sooji or Rava halwa is prepared on various festive occasions in India. 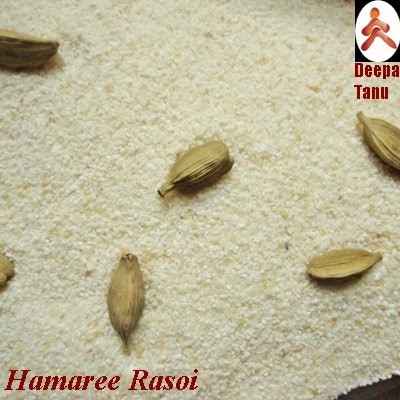 This is my Mom's favorite dessert as it has a very aromatic scent (because of 2 wonderful spices: cardamom and saffron). Dipping saffron strands in milk helps the saffron to release its beautiful colour. I have turned this into be-jeweled bangle !!! Soak the saffron strands in 1/2 cup boiling hot milk. Keep aside. Mix water, sugar and cardamom in a saucepan. Stir continuously over low flame and bring it to a boil. Now add the milk that contains saffron strands. After 5 minutes turn off the gas. Cover the saucepan for few minutes so that the aroma infuses in the syrup. In a skillet (kadai) pour ghee and put it on medium heat. Once the ghee is hot, add sooji and stir fry constantly over medium heat for about 12 minutes or until lightly golden brown (a good halwa's texture is light golden brown not dark brown). Now add cashew, pistachios, almonds and roast the dry fruits for 5 minutes. Pour the syrup over the semolina while mixing vigorously. It may splutter a little but will quickly stop as soon as the syrup is fully absorbed (this may take 10 minutes). Once the ghee starts to exude, remove from heat. Serve hot or at room temperature. 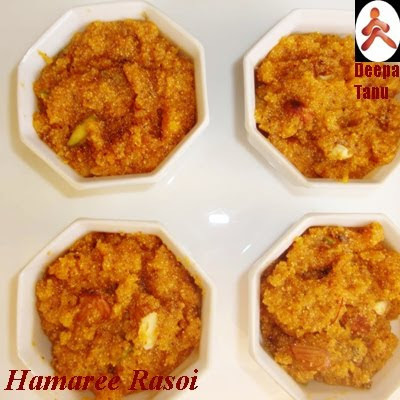 User comments & Tips: This halwa can be stored in the refrigerator for a week and can also be frozen in deep fridge. 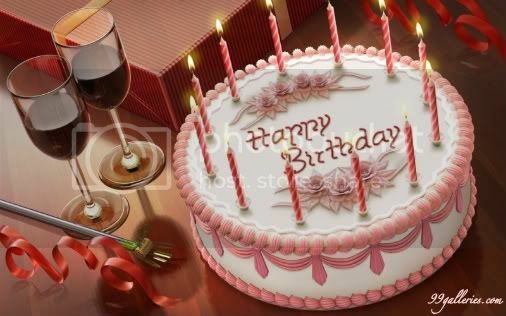 This post is dedicated to my very dear friend Sunanda whose b'day is on 24 March. Happy Birthday to you my dear friend. May all your wishes come true!!!! beautiful clicks deepa and halwa looks yummy..lovely colour..
Wow what a wonderful presentation...dosent look like a regular sooji halwa..
@Thanks Muskaan n Sadhana for appreciating the clicks. Woow!! !love halwa color,,,beautiful presentation..it looks grand and great.. Thanks a lot Soma, Chandana, Vrinda, Swapna for your lovely comments. @Swapna I'll surely pass it on your wishes to her. She will be so happy to see this on her B'day. Sooji halwa looks very tempting. Nice presentation too. @ Sarah: Believe me it tasted even better than it looked. @ Padma: Thanks for your appreciation. It really means a lot to me. @Gulmohar: Thanks buddy. I'll convey ur messg to her. Lovely presentation and my fav halwa, wishing your friend S a beautiful birthday..
yummy halwa and lovely presentation..
Yummy and delicious halwa!! colourful too..B'day wishes to your friend!! Hi Deepa Didi !! Well Suji Halwa is one stuff which is my all time favorite !! Yesterday only my mom prepared it for me...Your photos made me hungry again for this..Beautiful post as always ...Thanks for your comments on Unseen Rajasthan. Happy B'day to your friend. Your recipe is heavenly. Hi !! Please provide me your e mail Id !! Simply yummy!lovely color & cute presentation! That was a fancy decoration which i was wondering for a while.Nice presentation n clicks.Bet it would have tasted heavenly. I want to thank each of you for taking out your time to wish my friend. Hope to get your support in future aw well. I'm quite tempted by that! There's an award/tag-game for you on my Selo Commentarista Excelente Award post. Enjoy! 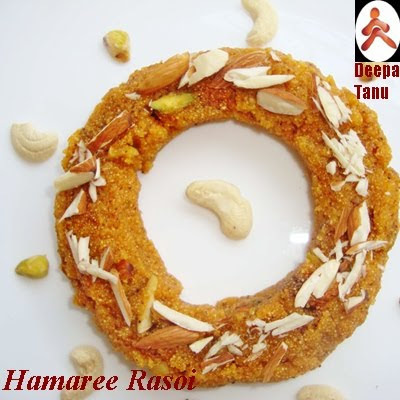 HI dear, halwa looks awesome & nice click.. thxs for visiting my site & ur lovely comment..
Wat a beautiful presentation! looks yum..